When we explored the networks to the details, one question was arisen: which nodes pair up with others? Recall in most networks, there exists a some different types of nodes, the probability of connection between nodes just have tight relation with the nodes' type. Take Internet as an example, the structure of the network reflects the existence of three broad categories of nodes: high-level connectivity providers who run the Internet backbone and trunk lines, consumers who are end users of Internet service, and ISPs who join the two. Again there are many links between end users and ISPs, while few between ISPs and other ISPs, or between backbone operators and end users. In terms of social network, this kind of selective linking is called assortative mixing, or homophily. A typical example of assortative mixing in social networks is mixing by race. The following table can illustrate it, which is the results from study of 1958 couples in the city of San Francisco, California. We can observe that people prefer to choose their spouses from their own race. More examples can be raised, such as mixing by age, mixing by incoming, and mixing by culture. Hence, it could say that the association would be created preferentially from those with homogeneous characters. In addition to that the links could be connected depend on the types of nodes, the degree is also highly correlated with the mixing. Does high-degree nodes in a network often associate with other high-degree nodes? or to low-degree ones? Needless to say, assortative mixing by degree plays a important roles networks, especially for the consideration of graph topology. Degree correlation can give rise to some interesting network structure effects. Newman investigated assortative mixing by degree by calculating the correlation coefficient of the degrees of nodes at each end of links, as shown the following tables. 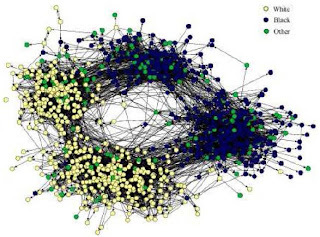 It could be observed that for so-called social network, it is positive for assortatively mixed network by degree, while for information networks, technological networks, and biological networks, it appears to be disassortative. However, it is not clear to explain the result. It is widely observed that most social network show the property of community structure, which means that groups of nodes that have a high density of links within them, with a lower density of links between groups. It could be used to explain the phenomenon that people usually cluster by their interest, education, age, and so on. 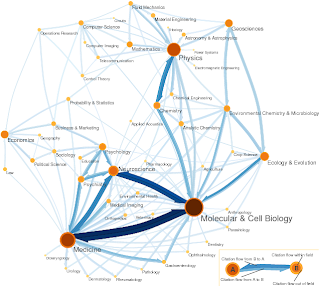 What follows illustrates the community structure by visualization of two examples: the first is the friendship network of children in a US school taken from a study by Moody, and the second is the science citation network taken from Eigenfactor.org. It is very obvious to see the effect of community. a) Degree centrality: nodes with high degree. b) Closeness centrality: nodes that have low distance to all other nodes. c) Betweenness centrality: nodes that occur on more shortest-paths. It can be illustrated via the following picture.